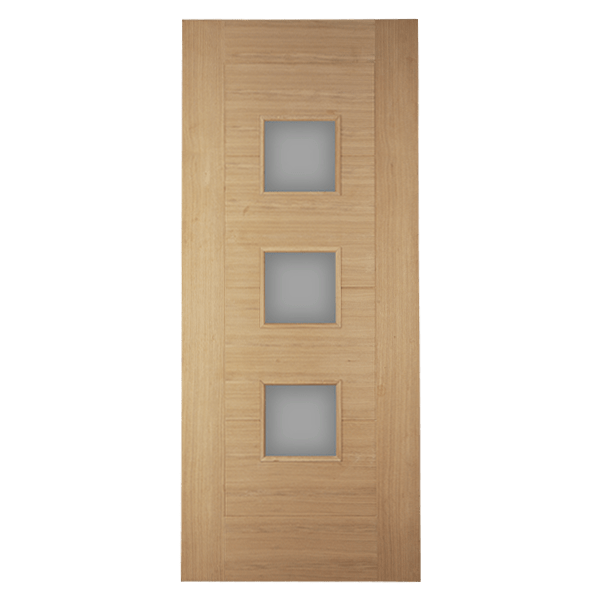 The Monza 3Light Premier Glazed Oak Veneer Exterior Door has a horizontal and vertical grooved finish that looks great in both modern and traditional homes. The door is constructed from engineered oak to ensure strength and avoid warping, and is sturdy enough to reduce sound transmission and maintain heat. This door comes with 3 panels of obscure toughened glass which is sandblasted on both sides to allow hanging either to the left or to the right. The Monza 3Light Premier Glazed Oak Veneer Door is sturdy enough to reduce sound transmission and maintain heat. Obscured toughend saftey glass, sandblasted on both sides to allow for hanging either to the left or the right.